This is the Ozark Birds of Prey project. My goal is to paint at least two of each species, working in series by the species. The list spans all of the Ozark birds of prey, which includes Arkansas, Missouri, and far eastern Oklahoma. As I get each one finished, I’ll link it to the gallery page over at PaleoPaints.com. The thing that sets my work apart is the color. Before I make a painting, first I make the paint. And before I make the paint, there are pigments to gather. I collect rocks, clay, and a couple of plants I know to produce light-fast pigments to create the palette used for each painting. If you’re interested in this process of making paint, check out my page on making watercolor paints. “Rhapsody”, Goshawk No. 2. 12″ x 16″, Ozark pigments on 300# Arches paper. “Goshawk No. 1″, 12 x 17”, handmade watercolors using Ozark pigments. If you’d like to help by providing photographed models of these birds, note which ones in the list I still need and shoot me an email! My addy is [email protected], and thanks in advance! Hi, I’m Madison Woods. I use foraged, light-fast pigments (from rocks, clay, or plants) to create the paint I use in my work. All of the colors you’ll see in my birds of prey in this project will be Ozark colors, except where I’ve used a bright white. That white is made from a clean chalk powder. First I collect the rocks, then I smash them and grind them to a powder. Once that is done I make watercolor paints by adding a solution of gum Arabic to the pigment. My art is literally created from the ground up. click to read my Artist’s Statement. Raptors fascinate me and I enjoy the challenge of bringing them to life on paper. They’re beautiful, specialized predators (except for the vultures, which are specialized cleanup crews). I think perhaps I like painting them most of all because being creatures of the air, they bring balance to the very earthy paint I use to portray them. I’m not painting in any particular order on the list above. However, I do tend to work in series. When I choose the next subject, I’ll prepare to paint two or three of that species. So that comprises a ‘series’. Once I get all of a family done (i.e. ‘hawks’, ‘falcons’, ‘owls’, etc. ), all of the series of the various species will comprise a ‘collection’. 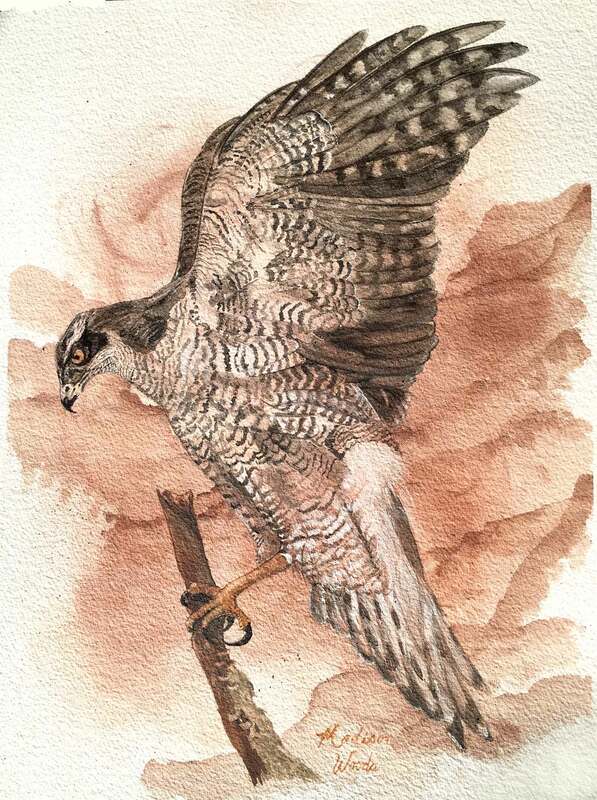 So far, as of February 2019, I have two raptor series (kestrels and goshawks) and no Birds of Prey collections yet completed. I began painting in July of 2018. If I keep to the current production rate, I should get around one per month completed. Hey birders! If you have good photos of any I haven’t done yet and want to let me use them for reference, email me! My addy is [email protected] I’ll be happy to send you a signed/numbered (first one) print. 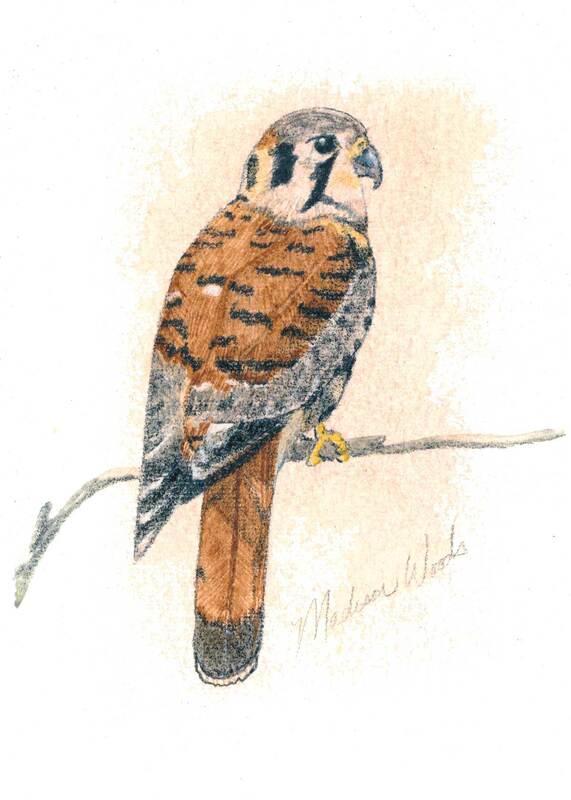 To see all of my Ozark birds of Prey paintings in one place, go to PaleoPaints.com. The links in the list above bring you to the individual painting page. Also in the list, the information in parenthesis indicates the order in which the birds were painted and the month/year it was created. I began painting altogether in July 2018, self-taught. My handmade watercolors are the only paint I’ve ever used. If you’re interested in following along as I paint, look for me on Instagram (@wildozark). I usually post a lot of progress pics throughout the process. I’d love to know if you’re following my work, so please leave a comment to let me know you were here. A comment also helps my website rank better in search engines, which brings more traffic my way. Thank you! Hey, Lady. You do fabulous work. Remember I mentioned By Golly, the old Arkansas Hermit PAinter? He painted exactly like you do, except I believe he made oils instead of watercolors. He was featured on one of the shows on PBS, and I did the Ozarks Mountaineer article on him because I knew him personally. I think if he were alive he would be happy to know you are carrying on the tradition!